Clayton Friedl, 75, of Whitewater, passed away Saturday, June 16th, 2018, from serious injuries sustained in a single car motor vehicle accident. His passing occurred at UW-Hospital Neurosurgery ICU, surrounded by his family. Clayton was the son of William and Margaret (McKenna) Friedl, and born on June 25, 1942, in Milwaukee, WI. 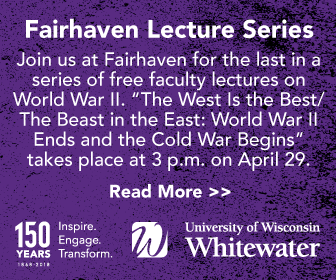 Growing up in Whitewater, all of his schooling was completed within the community, from early years at the university school, (part of UWW), and finishing at the three level local high school. Clayton excelled in varsity football, becoming one of the captains his senior year. In 1958 while football captain he was elected the homecoming king, and graduated high school in 1959. During school and after graduation, Clayton, worked with his parents expanding Friedl Fuel and Cartage. They offered products to the greater Whitewater and surrounding communities including commercial and residential services for over six decades. He worked as dispatcher/driver for R&L Trucking, when an on-the-job injury changed his life forever and forced his early retirement. Clayton enjoyed lumber milling, going for coffee, dinners with family and friends, and peaceful days at the home he and Carol built on Moose Lake near Antigo. His favorite thing was to sit on his deck with friends, looking out over the lake, brandy old fashioned in hand, enjoying nature with meat grilling in the background. He took pride in the 21 types of wood that were featured in the house, most milled by him. Other notables; active on the Whitewater Fire Department for three decades and obtained his light aircraft pilots license. Clayton is survived by his wife of nearly 22 years, Carol. Children: Debbie (Marc) Roe of Whitewater, Scott (Amy Kirner) Cross Plains, Tim Friedl of Whitewater. Step children: Debra (Steve) Owens, Diana (Leonard) Nickels, Bill (Wendy) Roth, Denise (Derek) Heydn, and Dawn (Rodger) Suprise. Grandchildren: Evan (Taylor Onsgard) Welter, Rachel (Cody Osborne) Welter, Violet Owens, Danielle (Aaron) Nowick, Jason, Justin, Christopher, and Christina Roth, Adrian, Victoria, Emily, Noah and Clara Heydn, Colton and Mckayla Suprise, and great grandchildren Kinsley and Beau Heydn and Nyssa Nowick. Clayton is further survived by his nephews Bill (Cindy Robers) Wendt and Douglas Wendt and his beloved dog Bailey. 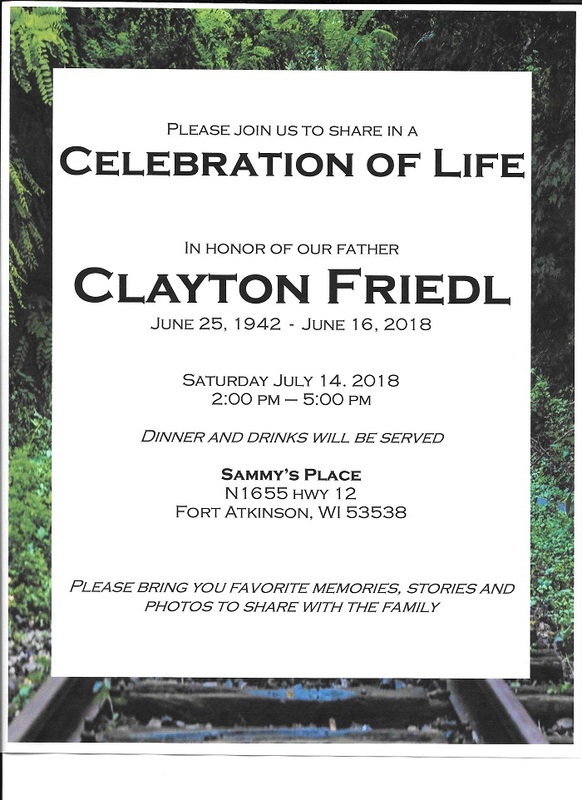 Clayton was preceded in death by his parents William and Margret Friedl, his sister and brother in law, Maureen and Douglas Wendt, son in law Randy Welter and beloved pets Brandy and Kelsey. The family wishes to thank the doctors, nurses, respiratory therapists and staff at UW Hospital neurosurgery ICU, Med Flight, Jefferson County Sheriff’s Department, Fort Atkinson Fire Department, Ryan Brothers Ambulance and the Whitewater EMS. They would also like to thank friends and community members for all of their support. The services will be held at 11 am on Saturday, July 14, 2018 at the Congregational United Church of Christ, 133 N. Franklin Street, Whitewater, WI 53190 with visitation on Saturday from 9:30 am to 11 am at the Congregational United Church of Christ. Additionally, visitation will be held from 4 – 7 pm on Friday, July 13, 2018, at the Nitardy Funeral Home Chapel, 550 N. Newcomb St., Whitewater, WI 53190.